It's easier to screw up a shoe than to make a great one, and I think that's what Adidas did with the Tennis Energy Boost. The Barricade Boost is a very good tennis shoe even though it's a bit stiff for some and forefoot cushioning could be better. The Crazylight Boost is a great basketball shoe, and you can use it for tennis too. Most of the Adidas Boost running shoes are great. I have a Boost running shoe that I bought for $37 on Amazon and it's extremely comfortable. My gf wanted a shoe for her work because she does a lot of walking and had foot pain, so I recommended a Boost running shoe to her and she loves it. But the Tennis Energy Boost was maybe the worst tennis shoe of all time for me. Tried the solecourt boost and could see it being a great shoe for the right foot (could be said about pretty much any shoe). For me the forefoot was just too wide and the shoe too hot. Love my bounce and boost shoes for casual wear, but for tennis I’m sticking with zoom zeros and vapors. Zoom Zero’s are a great practice shoe...too clunky for match play. Well, I have never heard of the Vapors being accused of being too hot. I thought it might be too clunky but it is very light weight for such large looking shoe. and that light weight seem to make it a great match day shoe. Plus that insane Cushioning seem to really come in handy when the match goes long 2 hours or more. I love them for match play. They are a quite quick shoe. Yes, and I meant that the Vapors run really hot too. Also, you are reporting, haha. Its definitely a D-2E shoe. If you don't have reasonably wide feet, there are better options. I've never had an issue with shoes being hot since the Pacific Northwest never gets very hot to begin with. That particular attribute is not even on my radar. Have inserted Birkenstock inner soles because just wasn't getting the sort of heel protection I needed. Due to an injury on the heel I really needed better protection than the boost offered. Anyway I have been getting the occasional sharp pain through the heel of the shoe on lunge steps. No doubt it is my own fault footwork however with an injury (Achilles Bursitis said the doc) I needed to act. The Birkenstock Birko-contact insole are just a 3mm soft compound inner sole, with high arch support, but on the bottom is a much harder plastic compound that is 8mm thick that cups the heel and extends underneath past the arch to just behind the metatarsals. The softer insole glued on top the harder under-sole is an effective combination. My first hitting after recovery have given no shocks. OVerall, by way of comparison, I do think Barracades give better heel protection (wider, firmer), but the Boost is so responsive and nice underfoot that it gives a different sort of energy return but perhaps at the cost of as-effective heel protection. Yer, I do reckon the Boost have worse ventilation, or just feel hotter (bootee construction), resulting in that wearing-a-raincoat at the cinema feeling.... urgh. Anybody have any insight on the new colorways coming (aside from the Black/White-Tan for clay season? Trying to decide if I snap up the Parley's or wait. Looked around on the web and came up empty. This is my go to insole and what I will be putting in my Solecourt Boosts soon (once my old Babolat SFX3's wear out). Protects the metatarsal area and provides a good heel cup for protecting the achilles. Highly recommend it for people with achilles tendonitis or metatarsal pain. I got 9 1/2 my usual size and it runs LONG. you should buy 1/2 size smaller in this shoe for sure, not because it is wide in front but it runs LONG. but otherwise this shoe is very luxury shoes, very comfortable everywhere, very secure in the Ankle which is great. If it was lighter it would be my match day shoes but it is too heavy. I will use it to go jogging and running. I dunno if it applies to other countries (and for how long! ), but right now Adidas France runs a 50% off promo on their Outlet. Which means the Sole Court Boost can be purchased for a few cents under 80€. Yeah, noticed the same thing here in Sweden and ordered myself a pair. That sounds like a great price (and Parley colorways are great too IMO). Regular price ($160) on Adidas website here in US. Much better off buying from TW where they are on sale ($139.95). I found them at 112 euros. Do you have any code to try ?? BTW the best Tennis shoe I ever had was a pair of Adidas Handball shoe, lasted longer than anything else. I did not try any coupons/codes at checkout. Usually most websites advertise on their main page (5-10% off if you apply this coupon code at checkout etc) but there were none on Adidas website. I am sure I can dig around and find something but I doubt it will bring the price under $140. And at $140 I can get a pair from TW with two day free shipping, without any hassle. Which country are you from? I was surprised to find 50% off deals in some countries in Europe to be honest, that is a no brainer! The sale seems to be universal for Europe. Down to 126 from 180 Swiss francs in Switzerland. How does the sole court boost size compare with the barricades? Should I get the same size ? Im a US 8 in barricade boost. Solecourt Boost: wore again for 2 additional singles matches. Really impressive ankle support almost like a 3/4 top without the bulk. If you have bad ankles/ankles that like to roll, these may be a good fit for you. Still no "break-in-pain" like I used to get with the barricade boost line. With regard to length/width, I do think they run both long and wide. I typically wear 10.5 to 11's (for width) and really think that I could go down to 10 with these (they are much longer wearing than I initially thought). The soles are holding up fine. Will go back the ubersonic 3 for a few matches. Hi how does this compare to the barricade boost sizing? Should I size down half a size? Thanks! Absolutely not for narrow feet, unless you half a size down and wear two pairs of socks. 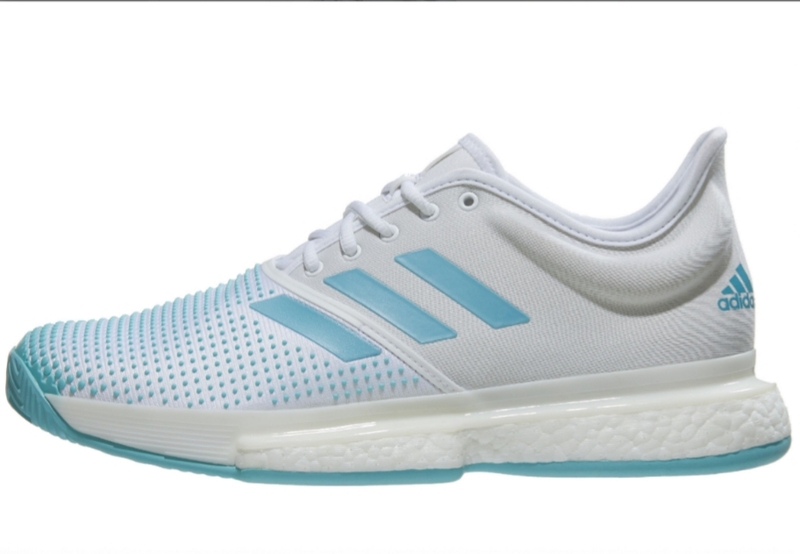 Snapped up parley for £69.99! They are £97.96 today at Adidas Outlet UK, where did you find them at £69.99 ? I received my pair today. Fits similarly to the last Barricade in length and width, but the upper is a bit closer to the foot. That said I have thin ankles, and the padding on the ankle collar is a bit too low for me; therefore I have slight heel slippage, and there isn't an extra eyelet for ankle locking lacing. The outsole looks much thicker in person than on pictures. I don't know if I'll stick with them: the booty construction of the Zoom Cages 3 fits me better around the ankle, but the outsole doesn't last. Would a few of the early adopters of the Solecourt Boost mind giving a 3-4 month update on the durability? Weekend only deal at adidas online. Not sure if it was mentioned here in this thread but just so everyone knows, Thiem is not wearing Sole Court Boosts (I mean whats new, he doesnt play with the racquet he endorses either, lol). Anyway, his latest video had a few close up that I took screen shots of. His shoes do not have Boost. You can see Bounce marking on the sole as well. Obviously custom made for him in both Parley and the other colorway. I had a feeling because his previous shoe was regular Barricade and switching to SCB is a big change. The feel and feedback is very different. But with pros, it is almost always never certain and hard to tell what they are using given the custom products they are provided for by their sponsors. Edit: Will add more pics if I see closeups in other videos. That shoe that Thiem is wearing has the sole of the Adidas CourtJam Bounce model which is a significantly cheaper model than the SCB and the upper of the SCB. Interesting choice, but the Bounce is underestimated around here IMO. It is more responsive, but not as cushy as the Boost material, but many pros are less concerned with "cushy" and more with response. Yes, I noticed that too about his sole being the same as that of CourtJam. I think SCB feedback was too much of a deviation from regular Barricade anyway. And you are right, SCB is borderline 'squishy' IMO compared to Bounce. That and with custom orthos in the mix, pros have different priorities, at least for Thiem it seems that way. the Bounce is underestimated around here IMO. It is more responsive, but not as cushy as the Boost material, but many pros are less concerned with "cushy" and more with response. SCB is borderline 'squishy' IMO compared to Bounce. That and with custom orthos in the mix, pros have different priorities, at least for Thiem it seems that way. If I can echo this - the SCB is too squishy and soft so that the lunge step where you land the very edge of the heel first sends shudders through to the bone. Tennis requires some comfort but also some shock absorbtion/resistance and it must be v hard to get it right. Boost is great in the gym or on the road but is just too soft for more extreme shocks through it. If Bounce is more substantial then I am going to check that out! I play on Rebound Ace with CrazyLight Boost and I am extremely happy (they have even more Boost in comparison with the SCB), but everyone has a different idea of what he wants from his shoes. I’ll have to check out the CourtJam Bounce. I had a feeling bounce might be a better option, but I had my finger hovering over the “buy” button for the Defiant Bounce. I have a pair of ultra boost... I guess they are running (?) shoes, and they are super-comfortable for chillin’, but feel like they would bottom out under any sort of running. I wasn’t even confident enough to wear them for a day at Disneyland. I really need to find something with a little extra cushion, as my knees and hips suffer if I play too much too often, but boost just may not be a supportive enough cushion. I’ll try them out at my local shop, but I’m inclined to try on the new NB Fresh Foam LAV too. Looks nice. Kinda prefer the uber 3's with the bit of black though. Played for about two hours in my new SoleCourt boost shoes. And even though they are a bit roomy in the forefoot, and despite them not being super tight around my heel, I love these shoes! My feet have never felt this good after playing for two hours. They felt less clumpsy than my barricades. The wider fit in the forefoot feels almost exactly as the first version of the Ubersonic. Played for about two hours in my new SoleCourt boost ... felt less clumpsy than my barricades. Totally agree, unsure if they differ that much in weight but perhaps just getting more rebound from the Boost making them feel lighter underfoot? That’s probably it because from what I understand they’re about the same weight. Someone wrote that the tounge moves when playing, I can confirm this. Not much at all but I noticed it about 1,5 hours in, so no biggie. Will try them out some more, but first impressions last you know. I’m a former barricade boost wearer and I’m currently trying out the new balance LAV shoes as well. Both of them cannot compare to the Nike Zoom Zero however in my opinion. The most comfortable cushioned shoes I have found on the market - and very stable as well. If you have tender knees like I do, I might suggest you put the Zoom Zeros at the top of your list to try. I’m a former barricade boost wearer and I’m currently trying out the new balance LAV shoes as well. Both of them cannot compare to the Nike Zoom Zero however in my opinion. The most comfortable cushioed shoes I have found on the market - and very stable as well. Barricade Boost is a completely different shoe than the Zoom Zero. Don't confuse the people who read your BS. Yep, totally different shoes with totally different pros and cons. Did I say they were the same type of shoe? I said are used to wear one kind of shoe and I switched to another kind of shoe that I found better. I am missing your point.